THE WINNING BLEND … AND SOLUTION … IS OMNIPAYMENTS! Question #1: There are 39 Time Zones. Network Technologies International, Inc. (“NTI”) is pleased to announce and welcome Tim Dunne as our Senior Vice President of Worldwide Sales. Tim will be responsible for the leadership of the NTI sales team, developing new business opportunities and strengthening customer and prospect relationships in the NonStop community. Tim has over 32 years of experience in the NonStop space, specifically the mission-critical sales of Payments and Infrastructure software solutions into key accounts for Integrated Research, the former GoldenGate, and ACI Worldwide. Tim attributes his longevity and success in this occupation to his respect for Customer’s time - listening to their needs, building trustworthy relationships, and collaborating with them to make their solutions a success. Keep an eye out for word from Tim in the coming weeks and months as he makes the rounds at the User Groups and begins initiating personal contact. Thunder uses a model-driven approach for generating COBOL, C and Java code for parsing and creating XML and JSON messages. Thank you again to all who visited our booth at this year’s NonStop Technical Boot Camp! To learn more about the Power of Thunder, contact Canam Software Labs, at info@canamsoftware.com. At XYPRO, we cultivate relationships with our clients for years. Even decades. In addition to investing in our software, they’re also investing in us. People buy from people and we like being the ones you want to work with. The same is true for the people that work here. We recognize that a willingness to try new things in both technology and mindful corporate culture engages employees and attracts the type of open minded, hard-working, forward thinking employees we want on our team. XYPRO endeavors to let our core values guide our decisions and help motivate. Many XYPRO programs are specifically put in place to achieve an environment in which the customer experience is paramount, employees feel valued and want to stay and contribute their best, long term. 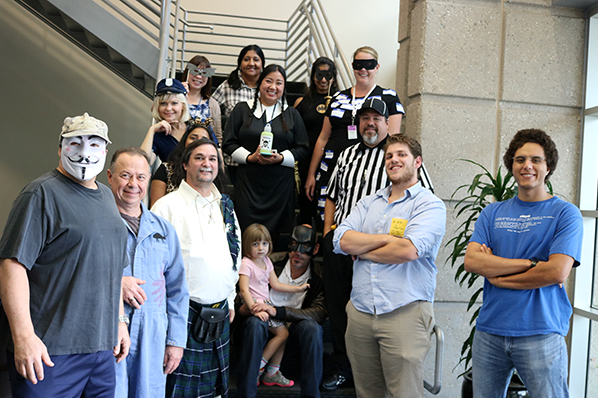 XYPRO is one of the honorees of Inc. Magazine’s Best Places to Work 2017. As part of a prominent inc.comfeature, the list is the result of a wide-ranging and comprehensive measurement of private American companies who have created exceptional workplaces through vibrant cultures, deep employee engagement, and stellar benefits. Out of thousands of applicants, Inc. singled out just over 200 winning companies and we were one of those companies! At XYPRO, we’re not here to mark the time between 8 and 5. Our customers deserve our best effort, as coworkers we deserve each other’s best efforts and in a company of our size, everyone plays a part in the success. XYPRO Leadership is responsible for the example we set and the appreciation we show our team & our customers. We take that responsibility seriously. It’s always about more than just business. It is often said “people do business with people the like” but more importantly, people do business with people they trust. “Like” is a byproduct of that trust. At XYPRO we understand that what we do today, matters today. It also matters tomorrow, next month, next year and even next decade. 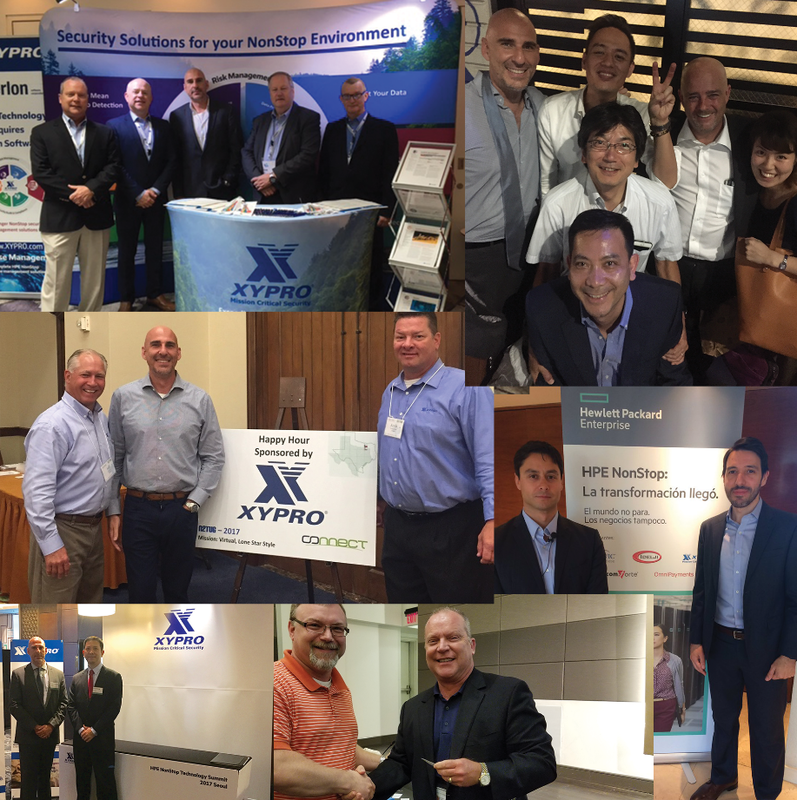 Like our customers, XYPRO is in business for the long haul and in a niche, global market with incremental, yet consistent growth, our honesty, integrity, and trust are just as important to our customers as are quality, innovation and our best of breed products and services. Whenever a decision is made to purchase a XYPRO product or service, whether for the first time or for the 21st time, the people our customers are most directly engaged with are our Sales Team. For this reason we strive to make sure our sales team are the right fit for the role and don’t just produce the right results. Our sales team is made up of sales professionals with extensive backgrounds in enterprise level sales and service, NonStop security fundamentals and an underlying compassion for the needs of our customers. “Sales” and “professionalism” aren’t always combined in the same sentence or in context with each other, but the XYPRO sales team is different. Our sales and sales-support team is spread across the globe; USA, Canada, Australia, Japan, Germany, Mexico, the UK and Argentina. They are as close to you, our customers, as they can be and are driven to serve. It takes a unique individual to be a XYPRO salesperson. You will most often see our sales team at your place of work, in your home city or at a trade event in another city. There can be a sense of glamour associated with the life of a travelling salesperson and to some level, that may be true yet the reality is that your place of work, your home city or the city you are in for a trade event is rarely, if ever, their place of work or their home city, and they do this day in and day out. They understand this is their profession and like all other professions, they have a purpose and are needed. 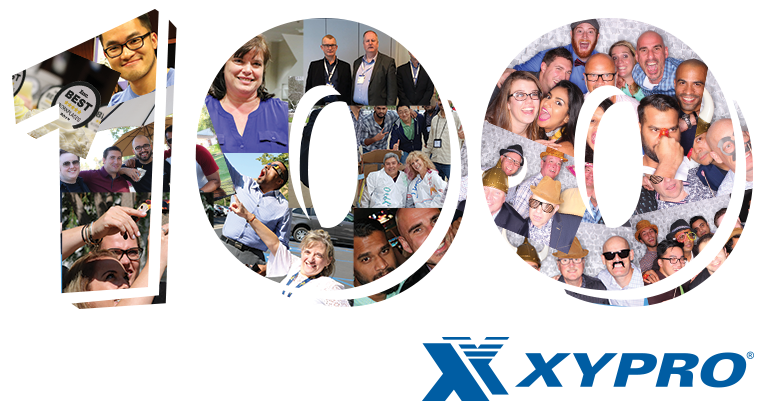 They too understand that they are an integral part to XYPRO’s success and that the corporate culture that XYPRO has fostered over the last 35 years is also the culture they enjoy and are part of, regardless of where they are in the world. Our primary intention is to serve our customers in the best way possible and in doing so, that culture also serves to create one of the best working environments anyone could hope for. The allure of innovation is what drives a lot of people. Everyone wants to be part of the next big thing. However, change for the sake of change doesn’t always equal progress. Innovation in most cases is a diminutive experience requiring multiple iterations and a lot of time and patience to execute an idea to move it forward, but there is no room for complacency. To be successful, one must find the balance between innovating and delivering genuine value to the customer. This is ultimately what technology companies are after. At XYPRO, we are not afraid of change. Leveraging the technology we have built over the last three decades has allowed us to identify new opportunities to innovate while staying true to our roots. We felt the NonStop should benefit from the modern technology available to other platforms. This strategy has allowed our customers to take advantage of the existing XYGATE product suite as well as benefit from the exciting new technologies we are investing in: Security Intelligence, machine learning, blockchain, modernization and much more. One of our largest projects to date is XYGATE SecurityOne (XS1), which is a security analytics solution. Data is what drives everything; from business decisions to where to eat lunch. Security is no different. We realized that the existing XYGATE product suite supplies a gold mine of security data that can be used for contemporary purposes. With XS1, we took a nontraditional approach toward development and it has paid off. Embracing Agile Development methodologies allowed our teams to quickly and continuously deliver deployable product. Combine that with a web enablement framework, modern programming languages and some of the newest technology available and we’re cooking with gas! Innovating in this manner also allowed us to attract top tier talent to work on XS1 ensuring high caliber execution. As part of the process, we brought in seasoned User Experience Developers, Machine Learning Scientists and other senior development resources. This all culminated into the most modern and easy to use security solution for the HPE NonStop server…and beyond. Our product development and innovation efforts don’t stop there. We unflinchingly look forward to identify where our research and development investments should be made to best serve our customers. This commitment has led us to new areas that will provide even greater value and security to NonStop customers and integrating the NonStop with the rest of the enterprise. In the continuing effort to keep the HPE NonStop server modern and “young”, XYPRO has a proven effective internship program where students from local universities get to participate and grow their skills in different areas of a software development company. Being an intern at XYPRO means participating in real projects, building sophisticated security solutions for mission critical operations and solving real problems for real customers. The year-round internship program hosts between 10 and 15 interns at any given point in time. Through this ongoing internal education and mentorship program as well as external education opportunities, our young engineers learn the principles of information security, the NonStop server and how it fits into today’s global economy. XYPRO’s talent recruitment program means some interns stay on with us as part-time or full-time employees and genuinely contribute with new ideas and modern approaches to research projects, modernization of legacy technology and expansion of our current suite of security solutions. Since the establishment of the internship program in 2011, XYPRO has converted over a dozen interns to employees in the areas of IT, systems administration, customer support, software development, QA, Business Analysis, and Project Management. In this issue of the Connection Magazine highlighting “The Best of NonStop”, we’re proud to discuss our clients and our team members. When one describes their ideal professional situation, it is a privilege to work for and with those we can honestly say are simply the best. There are some really exciting times up ahead – so stay tuned! We greatly enjoyed the 2017 Connect HPE NonStop Technical Boot Camp (TBC) held November 12-15 at the Hyatt Regency San Francisco Airport Hotel and spending time with so many of you. We shared ideas regarding how the HPE Shadowbase product suite can provide solutions to your most pressing business issues for business continuity, data integration and synchronization, and application integration purposes. We thank Connect and the HPE staff for hosting a terrific gathering. If you are interested in discussing our presentations’ content or would like us to present these or other HPE Shadowbase topics to your staff, please contact us. Congratulations to An-Chu Cheng of National Credit Card Center, Taiwan for winning our Google Home prize! To speak with us about your data replication and data integration needs, please call us at +1.610.647.6250, or email us at SBProductManagement@gravic.com. Hewlett Packard Enterprise directly sells and supports Shadowbase solutions under the name HPE Shadowbase. For more information, please contact your local HPE Shadowbase representative or visit our website. He's the master of his very own blend. 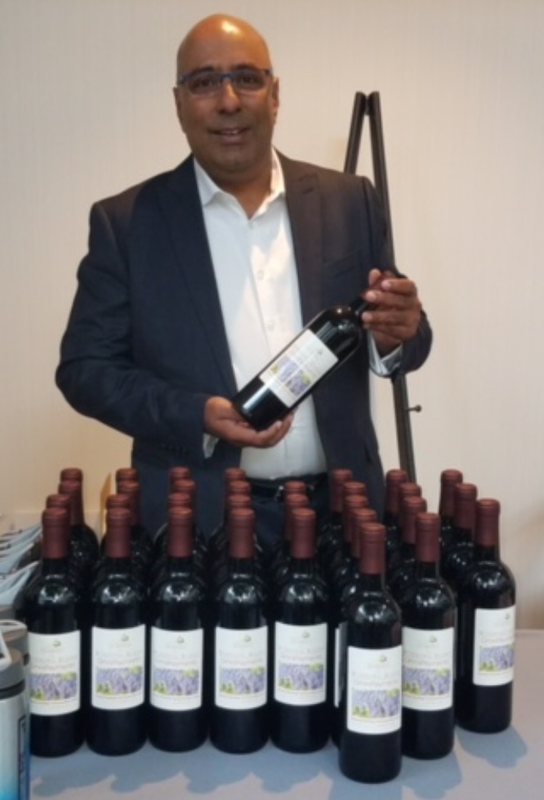 OmniPayments and its CEO, Yash Kapadia, sponsored a popular wine-making competition at the NonStop Technical Boot Camp, held this year at the Hyatt Regency San Francisco Airport from 12 November to 15 November. Conference attendees, now newly minted wine aficionados, were grouped into teams and tasked with the goal of creating the best blend by mixing a variety of red wines. The winning blend, named after OmniPayments, was bottled that same night; and attendees each were given a bottle plus an OmniPayments wine sleeve for safe transport. As competition sponsor and therefore honorary Chief Sommelier, Yash walked away with a few extra bottles. OmniPayments’ presence was apparent in other ways at Boot Camp. 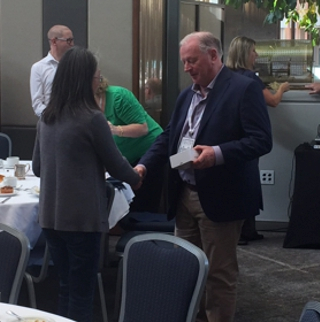 In addition to being the exclusive sponsor of the Boot Camp’s wine competition, we were a Diamond Sponsor and exhibitor; and our staff, customer representatives, and HPE introduced OmniPayments’ popular solutions via five well-attended sessions. Among the five were three case studies from Banco Agrario de Colombia; Banco de Crédito e Inversiones (BCI), a leading bank in Chile; and CCA, a prominent ACH (automated clearing house) processor in Chile. The OmniPayments Financial Transaction Switch is deployed on NonStop for the highest availability and offers all the requisite functionality to manage credit/debit-card transactions. It manages multiple devices, hosts application interfaces, and interoperates with third-party products or other systems if required. OmniPayments easily expands to provide additional functionality when needed and supplies complete security functions for every financial transaction handled, including encryption-at-rest and encryption-in-flight. Our Switch supports ATMs, POS systems, and both Web and mobile applications. Available 24x7, OmniPayments can be installed as a complete, off-the-shelf solution or can be enhanced with customer-requested modifications and features to improve cost-effectiveness, efficiency, and risk mitigation. It will survive any single fault, requires no downtime for upgrades or maintenance, and supports a range of disaster-recovery solutions. We also offer separately sold microservices that connect seamlessly to your other systems and solutions. OmniPayments’ open architecture and modular design permits gradual implementation for smooth migration from existing payments infrastructures. The OmniPayments pricing model for its standalone system is based on a one-time software license instead of on transaction volume. Our customers experience tremendous cost savings. OmniCloudX hosts numerous OmniPayments instances at a pay-for-use price so attractive that mid-size retailers and financial organizations now can enjoy the benefits of having their own high-capacity transaction switches. Each OmniCloudX customer pays only for the CPU resources, storage, and networking that it uses. OmniCloudX is continuously available with automatic failover to our other NonStop X systems located at OmniPayments data centers worldwide. Like our standalone option, we offer complete security functions. Starts at only $5,000 USD per month. Companies new to HPE NonStop often contract with OmniPayments to be their 24x7 Managed Services Provider. OmniPayments staff perform the administration, the maintenance, the security – everything that is involved in working with the NonStop. The customers enjoy all the benefits of NonStop’s famous mission-critical fault tolerance yet avoid the challenges of having to learn an unfamiliar system. OmniPayments systems in production today process 1 billion transactions per month via ATMs, point-of-sale terminals, and mobile applications. A single OmniPayments system can support up to 10,000 transactions per second. Multiple OmniPayments systems can cooperate to provide any capacity required by an application. To learn more about OmniPayments and its solutions, contact Yash Kapadia at yash@omnipayments.com or Jessica Nieves at jessica@omnipayments.com. We invite you to visit us at www.omnipayments.com or to join us on a variety of social media outlets. We are OmniPayments LLC. 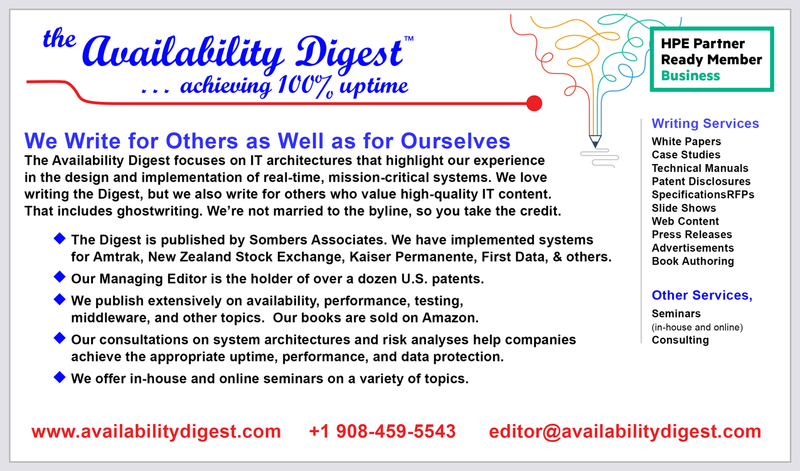 The articles you read in the Availability Digest result from years of experience in researching and writing a variety of technical documents and marketing content. It’s what we do best, and we provide our services to others who value high-quality content created by IT professionals. For instance, many articles that you see in familiar publications like The Connection, Tandemworld, and Connect Converge were ghostwritten by us for individuals too busy to write themselves. We also create white papers, case studies, technical manuals and specifications, RFPs, presentation slides, web content, press releases, advertisements, and so on. - You send us whatever information is available so that we can begin the research process. - You identify the people we need to interview, and we will conduct those conversations either onsite at your location or via other communication methods preferable to you. - We complete the writing assignment within the stipulated timeline and will send it to you for review, revisions, and approval. - You or your company owns the resultant work. We hold no copyright on it. In addition, Digest Managing Editor Dr. Bill Highleyman offers a variety of one-day and multi-day seminars on High Availability: Concepts and Practices. Seminars are given both onsite and online and are tailored to an organization’s specific needs. Popular seminars are devoted to achieving fast failover, the impact of redundancy on availability, basic availability concepts, and eliminating planned downtime. Published monthly, the Digest is free and lives at www.availabilitydigest.com. The November issue of the Digest will be published the week of 27 November. Please visit our Continuous Availability Forum on LinkedIn. Follow us as well on Twitter @availabilitydig. 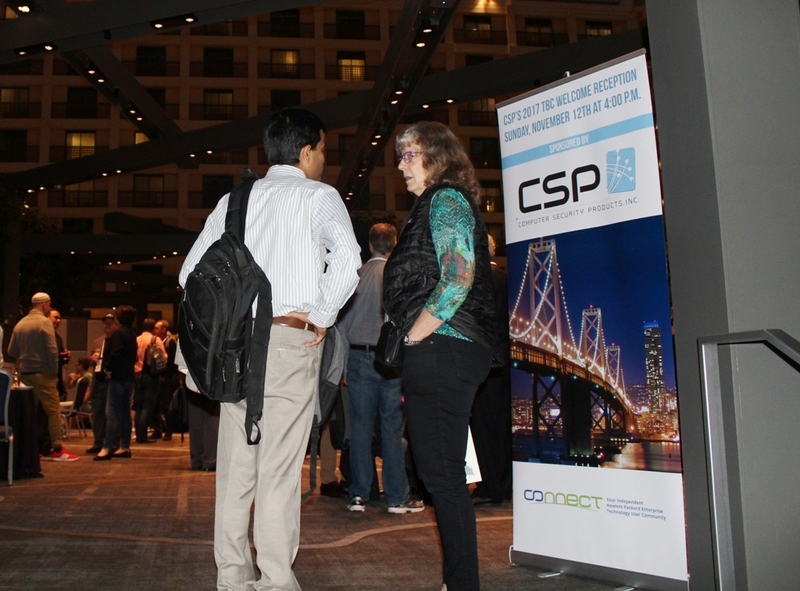 CSP was proud to be a Diamond sponsor as well as the sole sponsor of the Welcome Reception of this year's NonStop Technical Boot Camp held at the Hyatt Regency SFO Hotel from November 13-15th. 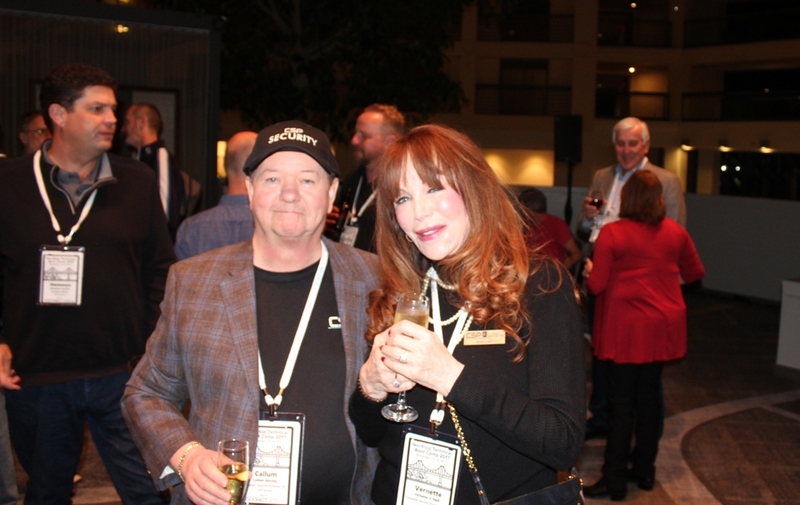 This year's Boot Camp was kicked off by an outstanding welcome reception on the evening of November 12th, sponsored by CSP. Guests enjoyed premium cocktails and hors d’oeuvres, all courtesy of CSP. The “Taste of San Francisco” themed reception was enjoyed by all who attended. We were extremely pleased with the positive turnout and would like to thank Connect for the opportunity to sponsor this special event. 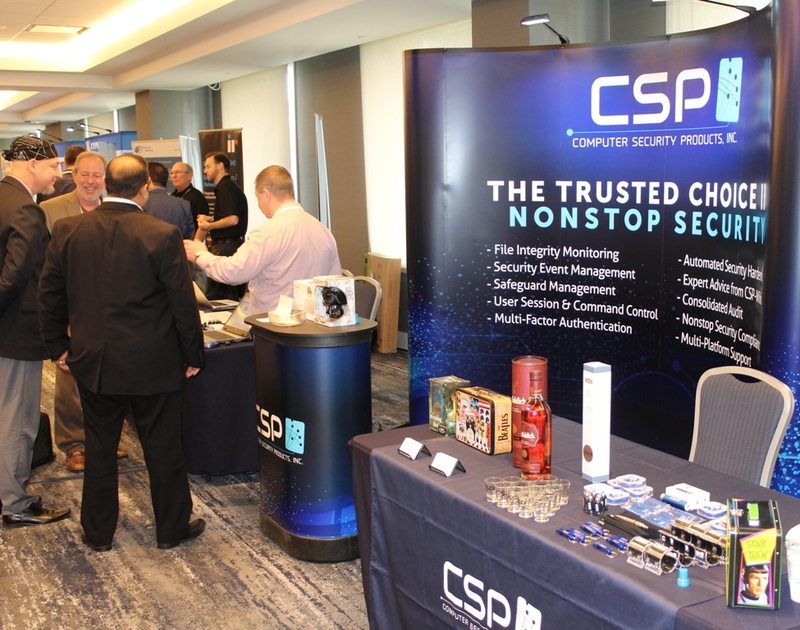 CSP also showcased Protect-X version 3.0 and Verify Elite, our new security and compliance solutions for Safeguard, OSS and Virtual NonStop systems, during our presentation, "The Future of NonStop Security". The session was well attended and generated a lot of positive feedback. It was a pleasure spending quality time speaking with all of the attendees who stopped by our booth and attended our presentations and social events. We were happy to see all the familiar faces as well as welcoming new ones. As always, the event provided some great informative sessions, excellent networking opportunities, as well as a host of one-on-one conversations. We would like to thank the Connect organizers, HPE, and all attendees for making this year’s NonStop TBC event a truly memorable one. Another Bootcamp in the books…….. 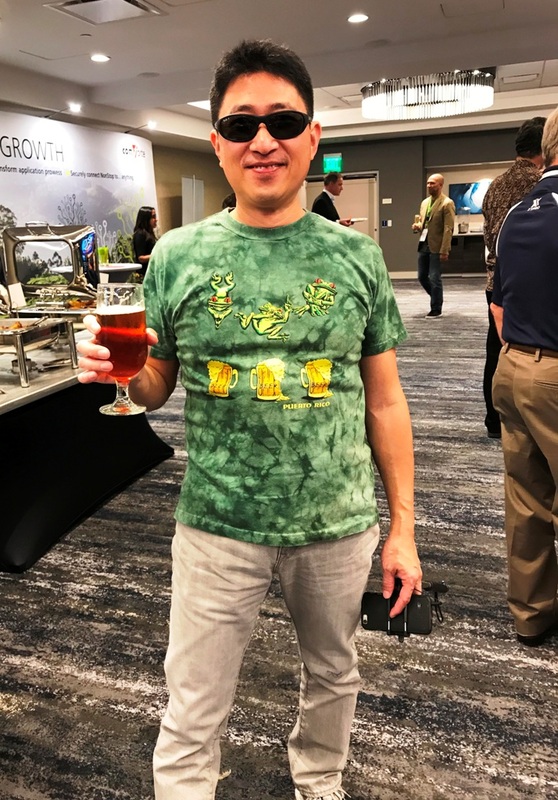 Along with many other HPE NonStop partners, Tributary Systems attended what proved to be a very successful event, this year at the new San Francisco Airport Hyatt Regency venue. First and foremost, we here at Tributary Systems would like to thank all the folks who work so hard year after year to put on this symposium; it’s certainly worth the effort. We’re pleased over the continued amount of interest in the industry for NonStop, the increased customer presence this year was obvious, this is of the utmost importance to the continuation of the NonStop platform. The backing of the greater HPE for NonStop was clear, we’re very encouraged by the additional investment in new versions of the L-Series servers, most especially the Virtual/Converged (and I’ll call it) appliance. 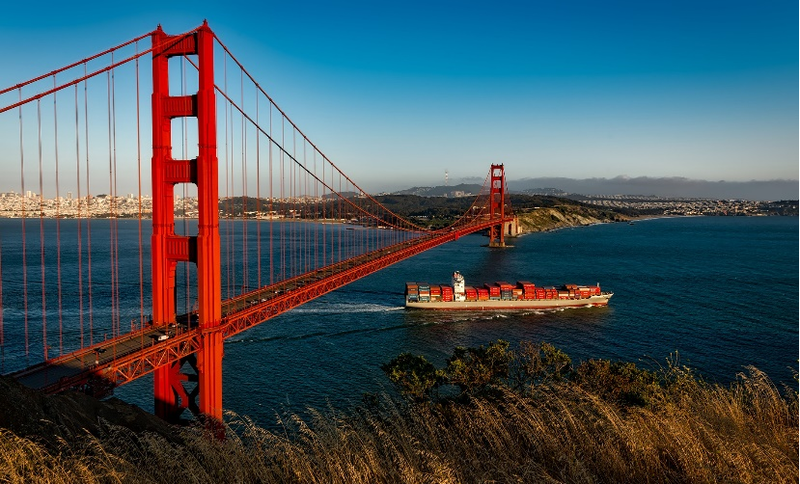 The future looks outstanding…………and Tributary Systems, plus other HPE NonStop Partners, customers, and HPE Team Members, will be back in Burlingame next November! Is there any NonStop customer who would not appreciate saving 40% or more in data backup and archive costs while simultaneously increasing data security, availability and backup/restore performance? Shawn then continued by detailing Tributary’s new, low cost, highly secure and highly scalable data backup, archival, and DR solution for NonStop. 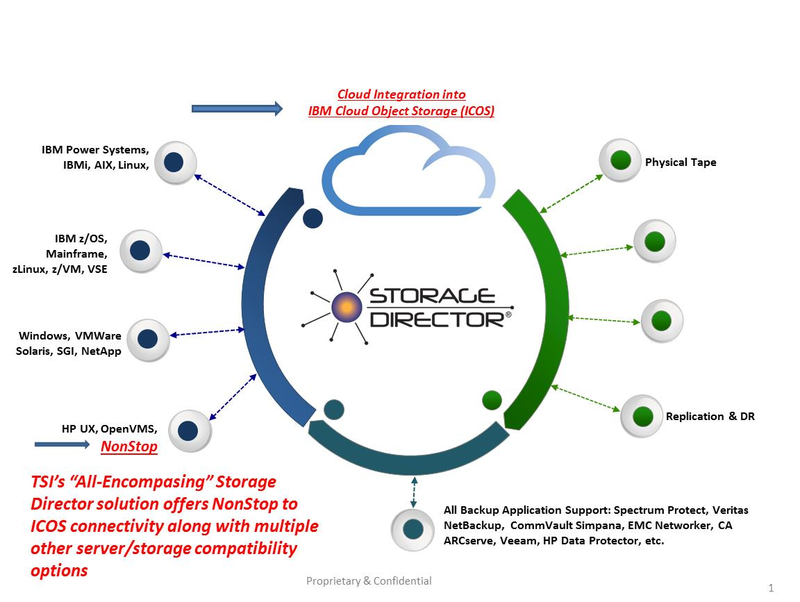 Using IBM’s Cloud Object Storage with Erasure Coding and Tributary Systems’ proven Storage Director, this innovation simplifies backup operations while reducing storage and archival costs. Have a wonderful Holiday Season, and safe and successful 2018, and we’ll see you all next November! Tandemworld would like you to assist some Students 3rd Year Students at Portsmouth University, UK,. They are conducting research into Business's that work closely with Freelancers/Contractors/Temp Staff / Agency Staff and how they engage with these individuals. Please click the following link to complete a quick survey of 17 questions, this should take no more than5 minutes..
Portsmouth Graduates and Tandemworld appreciate your assistance. Question #1: There are 39 Time Zones. How Many Can a Single NonStop System Support? Answer: All of Them with TANDsoft’s OPTA2000! Question #2: How Many Times Must the System Clock be Changed? Answer: Never with TANDsoft’s OPTA2000! You read it correctly. Currently, there exist 39 time zones (not 24) in the world. With TANDsoft’s OPTA2000™, a single HPE NonStop server can host thousands of applications on all of those time zones, with each application having its own virtual system clock. As more NonStop customers consolidate their physical data centers into the smaller footprint of the powerful NonStop X, OPTA2000 grows increasingly valuable by allowing applications to operate in local dates and times, independent of the current physical locations or time zones of their respective data centers. There is no need to ever change the server’s system clock. One System Clock. Multiple Current Times. Multiple Time Zones. Here is one example. A global manufacturer uses OPTA2000 to consolidate all of its disaster-recovery systems into one U.S.-based data center. The manufacturer’s backup systems are flexible and can be assigned dynamically to take over the processing of one or more failed systems anywhere in the world. By using time-zone simulation, the backup of a failed application can be given an operating environment that has the same time zone as the failed application. In this way, only a few backup systems are needed to protect many systems deployed worldwide. TANDsoft’s OPTA2000 is a virtual clock- and time zone simulator that allows existing backup, test, development, and production systems to support worldwide consolidated applications. It is user-friendly, easily installed, cost-effective, and requires no application modifications. OPTA2000 provides date & time and time-zone simulation for all HPE NonStop Guardian and OSS applications and data bases, with no code changes. Date & time simulation allows organizations to "time travel" their applications in the future or past to test all date & time sensitive logic, eliminating the need to manually change the system clock. Time-zone simulation allows applications to operate in any virtual time zone on a single NonStop server. OPTA2000 is the only NonStop solution available for such time-critical simulation. It is one of TANDsoft most popular products and represents TANDsoft’s expertise in interception technology. ● Requires no application source-code modifications, of particular importance when the source code is unavailable. ● Available for NonStop X and all other NonStop servers. In addition to OPTA2000, TANDsoft solutions include FileSync for automatic file synchronization, replication, and data deduplication; Sensitive Data Intercept (SDI) for protecting and masking sensitive data-at-rest in Enscribe, SQL/MP, and SQL/MX databases; the OPTA suite of interception and trace utilities (OPTA-Trace Online Process Tracer and Analyzer, Recycle Bin, Low Pin Optimizer, and EMS Alerts Online Startup and Termination Capture Utility); Stack Monitor, which alerts developers to the impending threat of a stack overflow; Command Stream Replicator, which logs and automatically replicates TMF-audited/unaudited FUP, SQL/MP and SQL/MX DDL structure and other environment changes to target systems; AutoLib, which automatically loads a user library or a DLL for executing processes; the Enscribe-2-SQL and TMF-Audit Toolkits and the Enscribe-2-SQL Data Replicator, all of which offer flexible, affordable alternatives to more expensive conversion products or manual conversion techniques; and E2S-Lite, which permits efficient, low-cost Enscribe modifications without the need to change a program’s source code. TANDsoft exhibited in the Partner Pavilion at November’s NonStop Technical Boot Camp. Our breakout session, “Identify and Protect Your Sensitive Data with Seamless Interception,” is now available for review at http://bit.ly/2Af9Bur. TANDsoft’s Sensitive Data Intercept™ seamlessly intercepts HPE NonStop database access calls, then works with HPE and third-party security products to protect sensitive data-at-rest by encrypting/decrypting data written to and from disk. Purchase SDI directly from TANDsoft for your masking, auditing, or logging needs. SDI masks sensitive data from unauthorized parties, audits who or what is accessing sensitive data, and logs the dates and times of access. Supports Enscribe, SQL/MP, and SQL/MX. No program changes are required. Source code unavailable? It’s not required either. For information about TANDsoft solutions, contact Jack Di Giacomo at +1 (514) 695-2234. Free trials are available. www.tandsoft.com. TANDsoft is an HPE Silver Partner. It was great to see everyone at the NonStop Technical Boot Camp. Another great turnout. We were very pleased to be able to meet with several TANGO and LitePOS clients. One of the clients explained how delighted they were not only with our TANGO solution but the HPE NonStop that they are running it on. They were new to NonStop hardware but are now completely convinced that the reliability, stability and availability of the NonStop is worth every penny. Another one of our clients at Boot Camp shared with us that they’ve been benchmarking TPS rates and TANGO has tested out with TPS rates that are triple what they expect to see in the future. He commented that there is no further need for them to invest in benchmark testing as the results clearly show the scalability of TANGO for all their future growth. 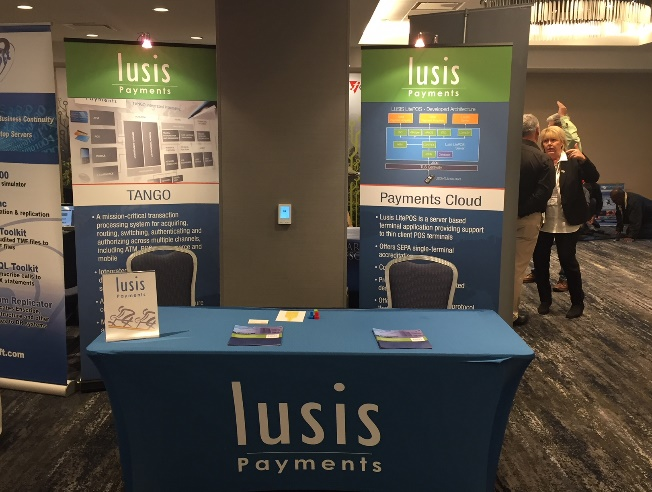 Lusis would like to thank everyone who stopped by the booth to meet with us, get their passports stamped and schedule webinars. We look forward to following up with everyone next week and beyond. We have much to share with everyone in the near future about a new Lusis AI business unit, our support to clients for ISO 20022, API friendly microservices for banks and much more. As in the past many of the sessions focused on the OSS personality with a lot of emphasis being placed on NonStop SQL/MX … On the other hand, at this year’s TBC, and definitely catering to those attendees that still depend on the Guardian personality along with Enscribe file management, there was more attention given to them than anyone can recall in past TBCs. “There was a lot more talk about leveraging your Guardian functions, Pathway servers and using new tools,” said Raye. To read more of what we observed at this year’s NonStop Technical Boot Camp, just follow this link to our latest post, NonStop Technical Boot Camp – looking back at what impressed DataExpress! If you have visited our NEWS BLOG pages on the DataExpress website, you are aware of our new sales partnership with comForte and even with the newness of the relationship, it was good to interact with the folks who are at the customer and prospect interface level. We have met with the comForte Sales folks prior to TBC - it was the best way to put our own stamp on the types of responses we would like to see coming from comForte as we were sure there will be questions coming from the attendees as the news of the relationship spreads through the NonStop community. The NonStop Technical Boot Camp (TBC) at the Hyatt Regency San Francisco Airport Hotel just wrapped up, a matter of days ago, and it held center stage for most members of the NonStop community. It proved to be an extremely powerful magnet as it attracted more than 400 attendees even as at times it felt there was a much bigger crowd present at the venue. Lots of foot traffic through the partner pavilion and even though the intent of this event was to educate, there was plenty of time left over to network and check out what other members were up to with their NonStop systems. NonStop – a time to mentor! NonStop Technical Boot Camp 2017 – it’s all about to happen! Foundations are never glamorous but when it comes to NonStop, they’re making a big difference! I’m on my way – HPE Discover 2017, Madrid! Aggressive; energized; and yes we are talking about NonStop! Block chain; block, block, chain; block, block, block, chain! Wrap up; following Day 3 of the NonStop Technical Boot Camp, 2017!